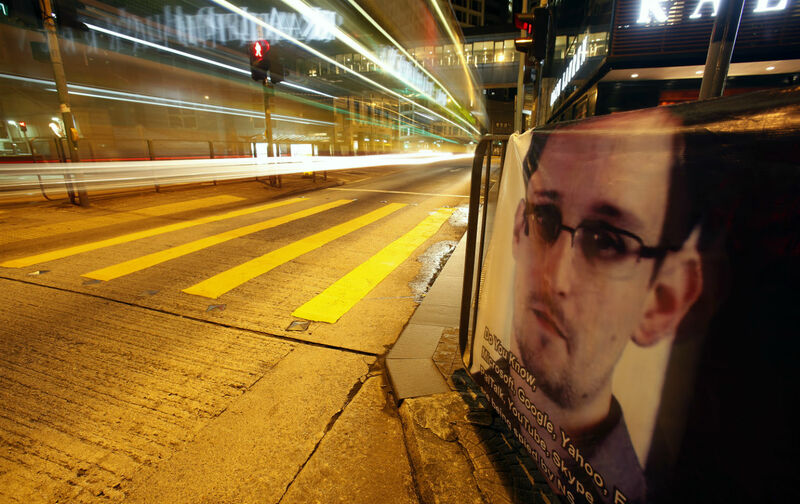 There’s a scene in Laura Poitras’s documentary Citizenfour in which Edward Snowden, who’s holed up in a hotel room in Hong Kong, pulls a blanket over his head as he logs on to his laptop. He’s worried that the National Security Agency—or, who knows, perhaps some other intelligence agency—has managed to fit his room with hidden cameras, and he wants to keep the spies from learning his password. The same scene, slightly fictionalized, appears in Oliver Stone’s Snowden, released in September. It draws a vivid contrast between the whistleblower—human, paranoid, fugitive, vulnerable, literally hiding under a blanket—with the surveillance agencies, which are mysterious, powerful, and seemingly everywhere. The scene also captures an essential point about Snowden’s story: Even as Snowden fights to expose the government’s secrets, he’s desperate to protect his own. In this narrow respect, we might think of the NSA and Snowden as mirror images of one another. In fact, people sometimes joke that the NSA’s acronym stands for “no such agency.” The joke is an acknowledgement that the agency’s power depends on its ability to keep its secrets, not just its ability to learn everyone else’s. This is probably more true now, in the digital age, than ever before. The digital age, our age, will give rise to many novel and vexing questions relating to the scope and substance of First Amendment freedoms. One reason for this is that the Supreme Court’s seminal cases relating to the freedoms of speech and the press—the cases that shape our public spaces and public discourse today—were decided half a century ago. They were decided before the advent of the Internet, the rise of technology giants like Apple and Microsoft, the invention of the search engine, the arrival on the world stage of transnational transparency activists, the development of end-to-end encryption, and the emergence of social media. Some of the factual assumptions that underlie seemingly settled First Amendment principles may no longer be sound. At the very least, over the next decade or two, the courts will have to determine whether to apply old precedents to very different contexts. Questions about surveillance, official secrecy, and individual privacy—the questions that Snowden’s story provokes—will be among the most significant that the First Amendment will have to answer. What is the government entitled to know about us, and what are we entitled to know about it? Here in the United States, the post-Snowden debate has taken place against the backdrop of the Fourth Amendment’s protection against unreasonable searches and seizures, but questions relating to surveillance, secrecy, and privacy have long been the province of the First Amendment, too. The First Amendment has long been understood, for example, to limit the scope of the government’s surveillance power. It’s long been understood to give the public, in certain narrow contexts at least, a right of access to information the government would prefer to withhold. Whistleblowers have sometimes argued that the First Amendment limits the government’s power to punish them for disclosing official secrets. The First Amendment had something to say about surveillance, secrecy, and privacy before the era of smartphones and social media. It’s worth considering what the First Amendment might have to say about these topics—and what it should have to say about these topics—now that the digital age has arrived. Questions about surveillance, official secrecy, and individual privacy will be among the most significant that the First Amendment will have to answer. What we learned from the Snowden disclosures is that intelligence agencies have become immensely powerful; that their surveillance capabilities have been directed increasingly towards us; and that the institutions that were meant to protect individual rights against the encroachment of surveillance power have failed quite spectacularly. Thanks to advances in technology and investments in physical infrastructure, signals intelligence agencies like the NSA can now continuously collect staggering amounts of data, retain it indefinitely, and analyze it with powerful tools that can identify patterns and connections nearly instantaneously. The NSA’s data storage facility in Bluffdale, Utah, is five times the size of the U.S. Capitol. The agency, which is estimated to have some 40,000 employees, is said to be the largest employer of mathematicians in the world. A now infamous NSA PowerPoint slide published by The Guardian is titled “New Collection Posture”; it states forthrightly that the NSA’s aim is to “collect it all.” Our intelligence agencies haven’t yet managed to achieve this goal, but they’ve come unnervingly close. Of course, they couldn’t have done this on their own. They’re parasitic on the private corporations that track what we buy, what we read, whom we talk to, where we go. The problem, as we’re continually reminded, is that virtually everything we do in the world leaves a digital trace, and multinational corporations lay claim to these traces. The phone in your pocket is a surveillance device that permits the tracking of your movements, communications, purchases, and associations. By examining your use of social media and search engines, an analyst can readily deduce your intellectual interests, religious views, politics, medical history, and intimate partners. There’s a sense in which a person who has access to all of this information knows you better than you know yourself. Courts have begun to tackle some implications of these new technologies from the perspective of privacy and the Fourth Amendment. In United States v. Jones, a recent case concerning the government’s covert installation of a GPS device on a criminal suspect’s car, Justice Sonia Sotomayor considered the conclusions that police might draw from the record of a person’s location over a period of 28 days. She wrote: “a precise, comprehensive record of a person’s public movements…reflects a wealth of detail about her familial, political, professional, religious, and sexual associations.” From seemingly innocuous data, some of it readily available to the public, the government can learn the kinds of things that most of us would once have recorded, if at all, only in our diaries, or in letters to our closest friends. The collection and retention of all this information is likely to have far-reaching implications for the freedoms of speech, assembly, and the press, though the change in our behavior may be subtle and gradual. A person who believes she’s being monitored may hesitate before participating in a political demonstration, visiting a website the government is thought to disfavor, or following an unpopular political group on social media. Someone who’s lost confidence in the promise of anonymity may hesitate before speaking to a reporter. A teenager who believes a record is being made of her activity on the web may hesitate before using a search engine to explore issues of sexuality. People who know they’re being surveilled will modify their behavior in response to the surveillance. Each of the hesitations may be innocuous or insignificant in itself, but the accumulation of them will amount to a transformation in the way we engage with the world and with each other. Perhaps more consequential than the fact that everything is collected may be the fact that nothing is deleted. It’s one thing to have to worry that anything you do online may be tracked by a corporation or government. It’s another to have to worry about the possibility that your data may be exposed, whether maliciously or inadvertently, 10 or 20 years from now. There are no second acts in lives lived on the Internet, as F. Scott Fitzgerald might have said if he’d been given the chance to sign up for an Ashley Madison account. The personal and political and intellectual risks you take today, and the mistakes you make as result, will be attached to you in one way or another for the rest of your life. In an effort to address a related problem, some privacy activists have advocated a “right to be forgotten”—a right to compel search engines and perhaps others to un-publish or suppress information that is outdated, inaccurate, or simply embarrassing. I’m skeptical of this effort, but in a world in which the delete button is a false promise, it’s easy to understand why so many find the proposal appealing. One danger here is that the fear of surveillance will have a homogenizing effect on us—that it will lead to a tempering of curiosity, to a tentativeness that infects the political and the personal, and even to what Bernard Harcourt calls the “mortification of the self,” a transformation that takes place when a person structures her life so that she has nothing to hide. In a world in which everything is tracked, conformity has a gravitational pull. Sometimes surveillance requires conformity. There was a story in The New York Times about a civil servant who had sued the French government over a regulation that banned smiling in passport photos. The law was necessary, the government said, because facial recognition software functions best when facial expressions are neutral. An instance of surveillance prohibiting free expression, quite literally. Maybe this is a trivial thing—barring people from smiling for passport photos—but it’s still a surrender of human particularity to the homogeneity required by the surveillance state. And there are less trivial examples. Over the last couple of years, the FBI has proposed that designers of computer hardware and software be required to build their systems in such a way as to facilitate government surveillance. Their products can be diverse in every way, the FBI says, but in this particular way they must all be the same. Social activity must accommodate itself to the overriding requirements of government surveillance. It’s worth thinking about all of this through a First Amendment lens. In the early 1960s, the Supreme Court barred a congressional committee from requiring the NAACP to disclose information about its membership; it reasoned that compelled disclosure of membership information would have a “chilling effect” on the freedoms of expression and association. In a world in which everything is tracked, conformity has a gravitational pull. Justice Douglas’s dystopia probably seemed overwrought and far-fetched at the time, but his fears are more difficult to dismiss today. During the demonstrations that preceded the 2014 revolution in the Ukraine, protesters attending a pro-democracy demonstration in Kiev received this text message: “Dear subscriber, you are registered as a participant in a mass riot.” The source was unknown, but the message was clear: Think twice. We’re keeping track. What you’re doing isn’t a secret to us. A recent study by PEN American Center, the writers’ organization, found that one in six writers had curbed their content out of fear of surveillance. The writers who responded to the survey were “not only overwhelmingly worried about government surveillance, but … engaging in self-censorship as a result.” A study published in the Berkeley Technology Law Journal found that Wikipedia pages that included terms associated with national security and terrorism were visited 20 percent less often in the months after the first Snowden disclosures than in the months before. The study’s author wrote that his findings were consistent with “a sharp, immediate chilling effect” and possibly with “a lasting impact” on total page views. Two years ago, researchers for Human Rights Watch and the ACLU interviewed journalists at American media organizations about the impact of government surveillance on their professional activities. The interviewees reported that government surveillance, and the related crackdown on unregulated contact between officials and the press, had combined to “constrict the flow of information concerning government activity.” Surveillance had made it more difficult for sources to remain anonymous in their dealings with the press, and the fear of surveillance was dissuading would-be sources from contacting reporters and making reporters’ existing sources more reticent. There’s something paradoxical in all of this. New technology has given us new ways of communicating and new ways of understanding. So many more possibilities are open to us now than were open to us only a generation ago. And yet, as the possibilities are expanding, our willingness to explore them may be contracting. The same technology that’s opening new worlds to us may be rendering us less capable of discovering them. Surveillance by governments and corporations may be making us risk averse and fearful. At least at the margin, we’re choosing not to say things we’d otherwise have said, not to investigate ideas we’d otherwise have investigated, not to report stories we’d otherwise have reported. There’s no censorship involved here, except what Aryeh Neier once called the “soft censorship of surveillance.” Congress has enacted no law directly restraining the freedom of speech, or of the press. But it might as well have. If the freedoms of speech and the press are to remain vital and meaningful in the digital age—if they are to survive the digital age—the next generation of First Amendment cases will have to grapple with the implications of surveillance. Snowden exposed the surveillance state, but he also exposed our ignorance. As alarming as the NSA’s surveillance activities turned out to be, it was at least as disconcerting that we’d known so little about them. Shielded by secrecy, the government’s activities had become unmoored from the democratic consent on which those activities were said to rest. Senator Ron Wyden of Oregon warned of precisely this when he said in the spring of 2011 that Americans would be “stunned” and “angry” when they learned how the government was interpreting the USA Patriot Act. But it wasn’t until two years later, when the Snowden disclosures first began appearing in The Guardian and The Washington Post, that we began to understand how wide the chasm had become between what we’d authorized the government to do and what the government was actually doing. The secrecy surrounding surveillance was indicative of a broader trend. The Associated Press reported last year that the Obama administration had set a new record for denying requests under the Freedom of Information Act. Agencies took longer to turn over files when they provided any; they said more often that they couldn’t find responsive documents; and they refused a record number of times to quickly process files that were especially newsworthy. Another measure of government secrecy: In each of the last few years, the FBI has issued thousands of national security letters, each one accompanied by a “gag order”—a judicially enforceable demand that the recipient not disclose the letter’s contents or even existence. And another: The Obama administration has prosecuted more people under the 1917 Espionage Act than all previous administrations combined. Perhaps more significant, it’s used the Act against whistleblowers like Snowden and Chelsea Manning, collapsing the distinction between those who disclose official information to the press and those who disclose information to foreign intelligence services. The government has been demanding more and more information about us, but disclosing less and less about itself. So the surveillance state has grown, but the empire of secrecy has grown, too. The government has been demanding more and more information about us, but disclosing less and less about itself. The essayist Elaine Scarry observed more than a decade ago that citizens were becoming more visible at exactly the time the government was becoming less visible. Especially in the spheres of national security and law enforcement, we don’t have the information we need in order to evaluate government policy, let alone hold officials accountable for their decisions. The First Amendment shouldn’t be indifferent to this. The Supreme Court has recognized that a core purpose of the First Amendment is to protect the free discussion of governmental affairs. It has recognized a right of access to criminal proceedings, and lower courts have recognized a right of access to civil proceedings and to certain judicial documents. The Supreme Court has rejected any “narrow, literal conception” of the First Amendment’s terms, and it has said that the Amendment is broad enough to encompass those rights that, while not spelled out in the Amendment’s text, are necessary to the enjoyment of other First Amendment rights. Perhaps in the existing case law there’s raw material from which the courts could construct a broader right of access, one that would render us less dependent on the Freedom of Information Act, an Act that’s failing us in many different ways. The First Amendment might also have something to say about the rights of government whistleblowers, without whose disclosures we would know far less about American military involvement overseas and surveillance policies at home. Chelsea Manning was sentenced to 35 years imprisonment for violations of the Espionage Act, but she’s appealing her sentence. My former colleagues at the ACLU recently filed a brief arguing that the Act violates the First Amendment unless it’s read to require a balancing of the government’s interest in secrecy against the public interest served by the defendant’s disclosures. At a time in which the President, the Director of National Intelligence, and the CIA director acknowledge that too much is classified, a criminal statute that fails to distinguish information justifiably kept secret from information that should never have been withheld should be regarded as constitutionally suspect, at the very least. And this is a crucial point: Governments don’t have a monopoly on new technology, or even on new surveillance technology. There’s big brother, but there’s also a proliferation of little brothers. The digital revolution that has enabled an unprecedented expansion of government surveillance capabilities has also given ordinary citizens new means of holding the powerful accountable. We should expect the next generation of First Amendment cases to grapple with the expansion of surveillance power, but also with the partial democratization of it. In September, Alex Younger, the chief of MI6, the British analog to the CIA, gave a rare public speech in which he acknowledged that the information revolution had “fundamentally changed” his agency’s operating environment. “The digital world is a very interesting combination,” he said—a “golden opportunity” but also an “existential threat.” MI6 finds it easier to collect secrets, but more difficult to protect its own. Let me conclude with the image I began with, of Snowden guarding his own secrets as he tries to carry out what we might describe as a particularly radical form of sousveillance. The image has little in common with the ones we most often associate with the First Amendment. It doesn’t involve a printing press, or a prior restraint. But the threats to free speech today are different from the ones that confronted Peter Zenger almost 300 years ago when his New York Weekly Journal skewered New York’s royal governor, William S. Cosby. As Richard Kluger observes in his biography of Zenger, challenges to First Amendment freedoms take many forms, and subtle and indirect threats can sometimes be more perilous than overt and direct ones. With this in mind, Kluger warns of “governments in garrison states and open societies alike” that are “stealthily wielding sophisticated tools of surveillance in the name of national security, no matter the wholesale loss of personal privacy and dignity.” Few images are likely to capture the most serious threats to the freedoms of speech and the press today as neatly as the image of Snowden facing down a surveillance agency that has hoovered up so many of our secrets while so jealously guarding its own. Jameel JafferJameel Jaffer is founding director of the Knight First Amendment Institute at Columbia University, which works to defend and expand the freedoms of speech and the press in the digital age. Previously, he was a Deputy Legal Director at the ACLU.